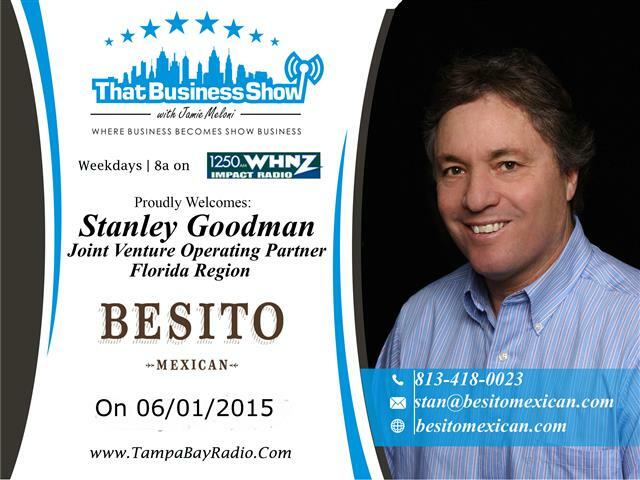 That Business Show Recap 06-01-2015 Featuring Stanley Goodman and John Rodriguez Sr. Happy Monday everyone and #ThatBusinessShow enters week 18 this week and the show continues to grow each and every morning at 8am on 1250WHNZ. All shows are streamed live in studio as well and catch the live video at http://www.tampabayradio.com! On the first half of today’s show, Stanley Goodman, Joint Venture Operating Partner with Besito Mexican, was in studio. Besito Mexican is a first class authentic Mexican cuisine restaurant that is located at 205 Westshore Plaza in Tampa. They open for lunch at 11:30 am and feature a great happy hour with amazing specialty margaritas and have a selection of 75 different tequilas. They also have a room for meetings that is setup for business or personal use and is without charge, just contact them to reserve the room ahead of time at 813-287-4800. Besito, meaning “little kiss” in Spanish, treats each restaurant as a love story, hence the term Besito. Their restaurants are an extension of the connection and respect they feel for one another and the food they share. The Tampa location is the 6th location of this brand and with over 50,000 Facebook fans, is a growing business. Originally founded in New York, the culture and cuisine has carried the brand into these other markets including Tampa. Each patron gets fresh table side made guacamole which is amazing and I don’t even like guacamole and at the end of the dinner you get a couple of worry dolls. These worry dolls, good for one worry each, will rid you of your worries when placed under your pillow at night, just be sure to visit Besito Mexican for more to make all of your worries disappear! Learn more at http://www.besitomexican.com! 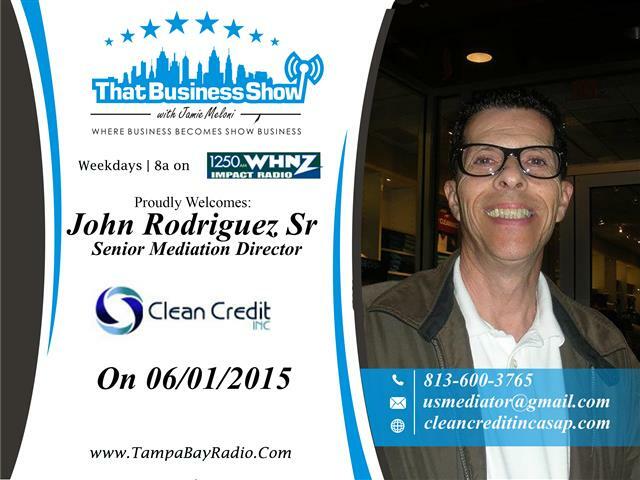 On the 2nd half of the show, John Rodriguez, Sr. checked in with US Mediation Services. John and his company assist debt stricken individuals with an alternative approach to resolving this problem through mediation services. After a career in Information Technology at Bear Stearns that was cut short by the events of 9/11, John launched his own business, a Jani-King Franchise that failed in 2007 and left him with over $86,000 in debt. Out of desperation, he contacted a Law Professor he knew for assistance and through the use of mediated services was able to resolve himself of the debt within 18 months. It was this situation that inspired him to help others through US Mediation Services. Today John specializes in mediating debt and assisting banks, finance companies as well as Realtor and Mortgage Professionals with their candidates that do not get approved for financing due to unresolved debt. They help with collections, judgments, federal and state tax relief as well as wage garnishment issues and are not a credit repair company but rather a mediation assistance company that deals directly with the debt and works to reduce or resolve it rather than disputing its authenticity and denying it is the consumers like many credit repair agencies do. John can be reached at 813-600-3765 or email at usmediator@gmail.com for more information!